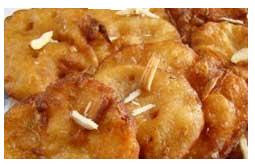 Malpua is a very popular dessert prepared mainly in North India. It’s a pancake dipped in sugar syrup. Malpua is also served at wedding buffets. If you don’t want to prepare the batter with milk, you can also do it with water. In some households, malpua is made on the occasion of Holi, the festival of colors. 1. Reduce milk to 1/2 by heating it on medium-low heat. Stir frequently. When it's half in quantity, turn off the heat and allow to cool. 2. Sift together maida and baking powder. Add cool milk to maida and make a batter of thin, pouring consistency. Batter should be like that of pancake (chilla). Set aside for 15 minutes. 3. In the meantime, prepare sugar syrup or chashni. Boil sugar with water to 1 string consistency. To test this, dip a spoon in syrup, touch carefully with your forefinger. Press your forefinger against your thumb. When finger and thumb pull apart, a thin string should form between them. It should not be 2 or 3 strings but just 1 string. 4. Add cardamom powder to syrup and keep it warm on very low heat. 5. Heat ghee or oil in a non-stick frying pan. Drop 1 tablespoon batter in the ghee, it will spread out in a round shape. No need to try to give it a shape, it will take a round shape on its own. Fry from both sides till brown. 6. Drain out this round or malpua and place it in syrup for 15 minutes. Similarly make other malpua from rest of the batter. 7. Remove malpua from syrup and place it on a serving plate. Garnish with sliced almonds.